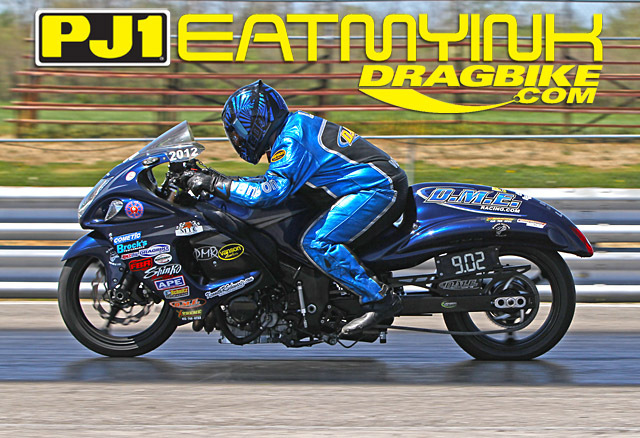 Lingering winter weather tried to hold the upper hand as America’s fastest growing motorcycle drag racing series—NHDRO—started 2017 with their “Money in Muncie” season opener. But NHDRO’s staff and family of racers hunkered down and fought through Saturday’s cold temps and high winds to complete a schedule of qualifying and bracket racing to prepare for sunny skies and a warmer Sunday. NHDRO boss Brian Welch had the foresight to bring along Lucas Oil Raceway’s hard-working Kyle Lang to oversee Muncie Dragway’s track prep and bring down the tree. 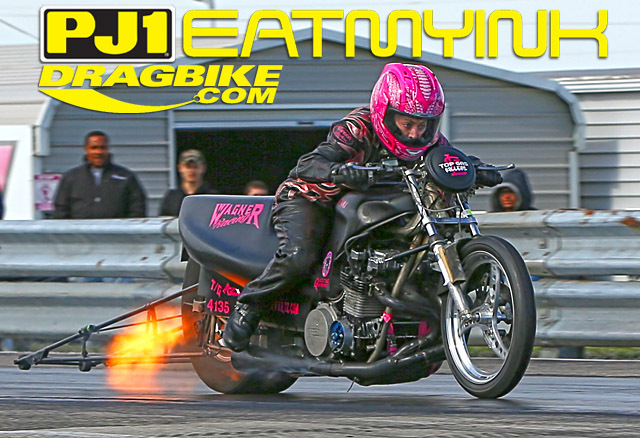 The average track temperature on Saturday was 62 degrees, but Lang kept conditions safe and as quick as possible for everything from the street-legal, 700 horsepower bikes of McIntosh Machine & Fabrication Pro Street to big-tire, 4.60 dragbikes. Former Pro Street champ Doug Gall has a reputation for racing anything on any kind of surface, and this weekend even hot-lapped and spun a shifter kart he’d stuffed a CRF450 motor into. So when it came to mastering difficult conditions, Gall was The Man—qualifying number one and beating Justin Doucet on his way to the final round win over Quicktime Motorsports’ Rudy Sanzottera. “I’m always the bridesmaid,” Sanzottera moaned afterwards in his trailer. Gall won last year’s season opener as well, but did it this year with a revamped tool. 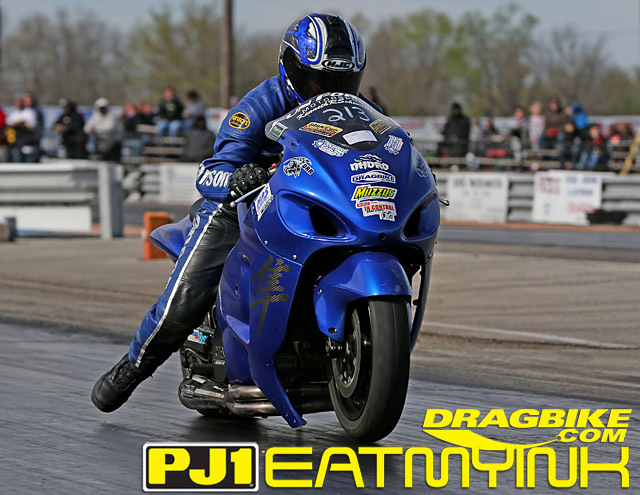 “Probably the biggest thing is Dunigan and DME are helping me out this year with my chassis and motors,” said Gall. “I think this was the first time in a couple years I left the race with the same motor I started with! I still have a few gremlins to work out, but we will be ready for Indy.” And perhaps a run at another championship. 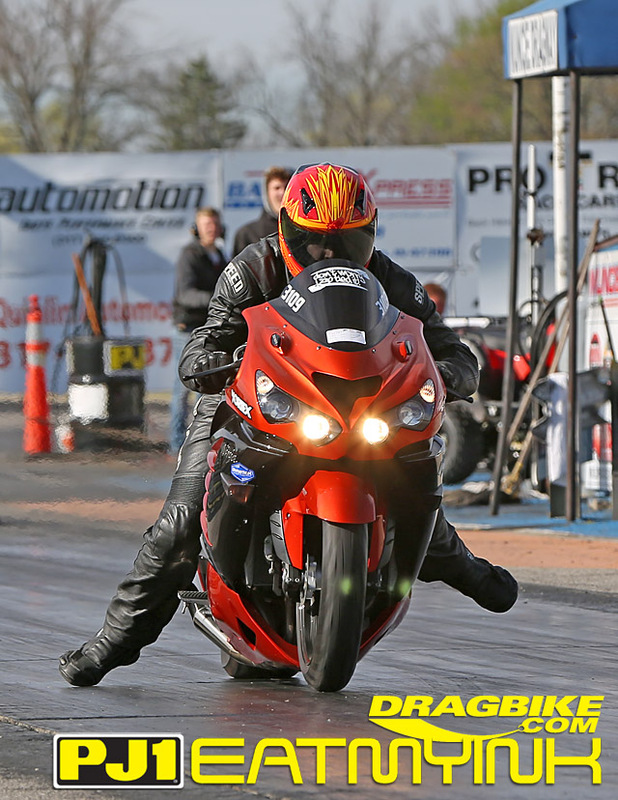 The cold forecast put a damper on pro class bike counts, including NHDRO’s brand new APE/Trac King NOS Pro Street. Riders that showed but decided the track was too cold will have their tech cards honored in May at Indianapolis. Dan McCarten’s long struggle to sort out his “War Machine” Kawasaki culminated in the intended result—a Quicktime Motorsports /Lindeman Performance Pro Ultra 4.60 win. “I started using nitrous 25 years ago with help from Ed Grothus,” said McCarten. “Now 25 years later I’m starting all over again with a completely new setup with the help from the same guy. Everything old is new again.” Especially winning….that never gets old. 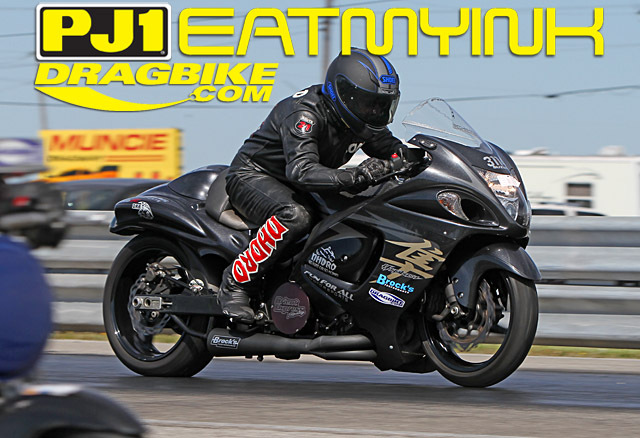 McCarten beat class sponsor Jeff Lindeman on his way to the final with Justin Hughes. Sanzottera and champion Chase Morris went out in round 1, and Fast Times Motorsports boss Jeff Jones lost to Hughes in the semi. “Top Gas Killer” Baldi finished a close second to champion Greg Mallett in last year’s points battle and has gotten the jump on the summer-long fight this year as Mallett lost early to no-bar ace Dustin “Biscuits” Lee. Lee took the M2.Shocks Crazy 8s final over Ben “Back in His Groove” Knight, who beat John “Spooky” Markham in the Kevin Dennis Insurance Street ET final. 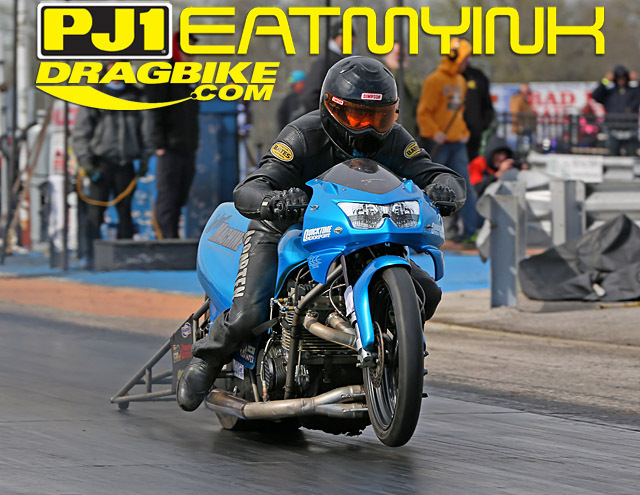 Markham also lost the Millennium Trailers Super Comp final to Ron “Jiu-Jitsu” Arnold, but beat Jeremy England in the Route 21 Street Fighter final in what was a ruthlessly good weekend for the Death Row Racing team. 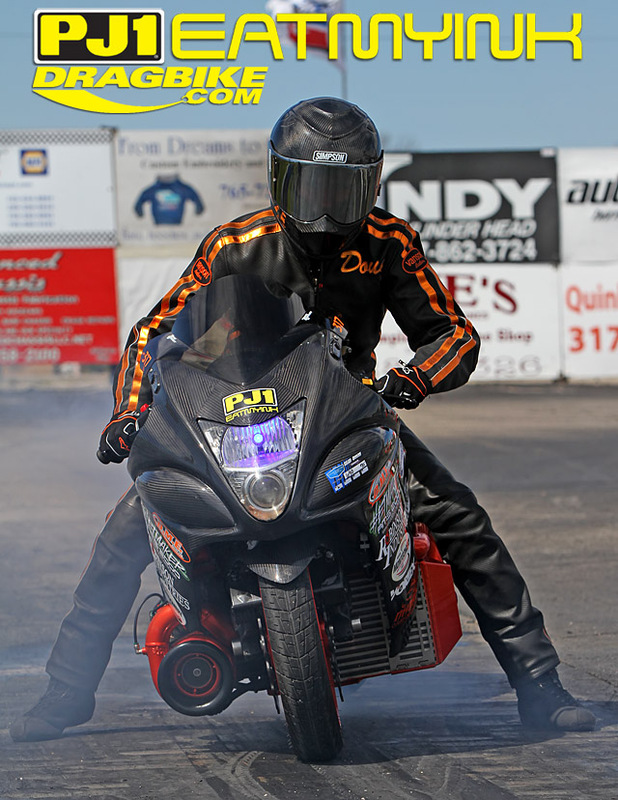 The Super Comp victory was multi-class winner (and defending MPS Pro ET champion) Arnold’s first NHDRO win in the class. 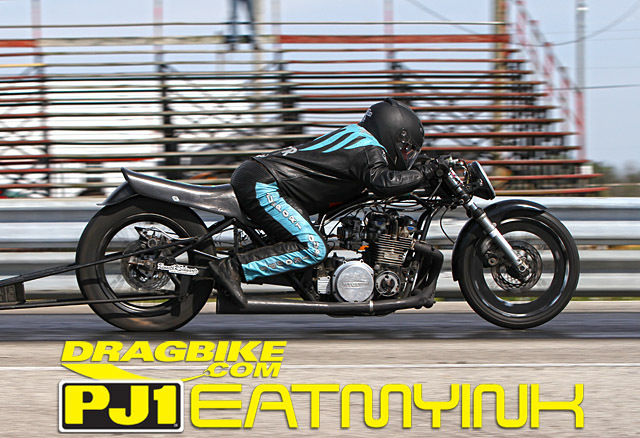 Arnold rode his streetbike past defending Super Comp champ Markham and his dragbike in the final. 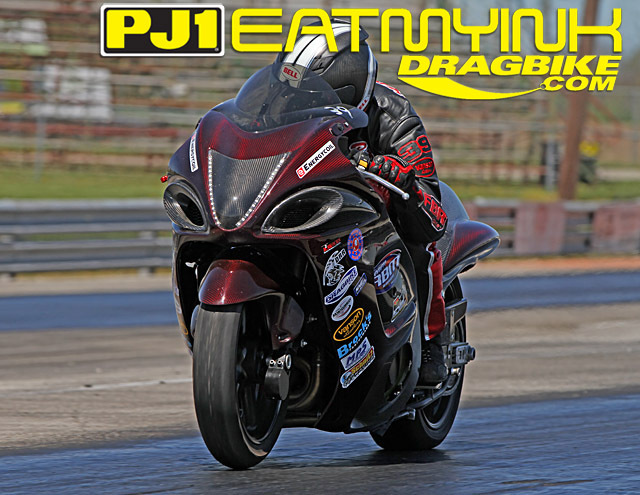 Eric Cooper took Sunday’s MPS Pro ET final on his old school KZ Kawasaki dragbike over Scott Sheppeard, also on a Kawasaki dragbike. KJ Sowers scored her first NHDRO win by taking Saturday night’s Pro ET final over the ever-present Lee. In fact, Lee lost two finals Saturday night, ceding the Street ET winlight to Cody Combs. NHDRO also debuted their brand new app, available for iPhone and Android at their respective app stores. Load it, stay in touch and watch as NHDRO grows!